Pedigree Ragamuffin kittens Ready, beautiful..
pedigree ragamuffin kittens ready, beautiful longhaired kittens 2 pure white like cotton wool soft and thick longhaired boys 2 red and cream thick cotton wool boy kittens and a tortie thick longhaired girl all ready for new homes have been vet checked already and have been wormed and flead will all be. 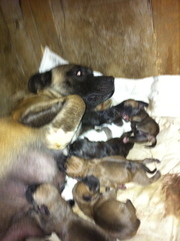 Puppies are born on 7th August 2011 different colours. looking for fluffy female white kitten. Bengalicious Bengals have 3 beautiful Brown Arrow Rossetted Kittens for sale. All Kittens are sold desexed, microchipped (in your name), Registered, Plus come with a Kitten Pack. We are accepting $200 deposits Now - Kittens will be ready to go to their new homes on 06.07.2011 (at 12 weeks old) the remaining $600-$800 to be paid in full before kitten goes to their new home. Good looking Himalayan kitten now ready for sale. 1 three month old tabby kitten. Wormed. girl, very loving and playful. Ideal as a family pet..
For Sale in Hervey Bay: Female Ragdoll/Siamese Cat "BELLA"
WANTED: A GOOD HOME for BELLA Half Ragdoll/Siamese Cat Female 3 years old De-sexed Beautiful Nature Cost $350 Selling: $100 Neg. Approximately 5mth old domestic short haired tabby cat. Very affectionate and playful. Fully litter trained. 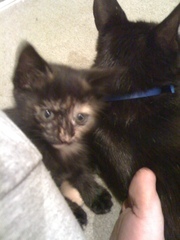 Looking for a loving home..
One female persain and one male, one female exotic kittens. Desexed and vacc. Registered breeder with FCCV. For pets/showing. Parents both Melbourne show winners. 9 weeks old ready to go in two weeks. Ph 0422677544 or(03) 54470840 after 7pm $600..
Persian Kittens for sale the are so adorable well home and potty train and will be coming along site with all vet document please contact for more information about them..
white coloured persian kitten for sale . she is very nice and lovely . 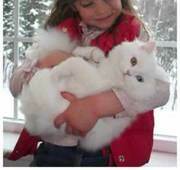 this pet is vet checked , reed rom worms and vaccinated ..
free half persian cats.. to cat lovers, can be seperated. beautiful. one is 8 months female great with kids and people. Black half persian, gorgeous.. The other is her mum, 18 months old female half persian, black very fluffy also great with kids and people.Beautiful natures. toilet trained, wormed..Regretful give away.. must go to cat lovers. do not want them to end up at the pound. 5 fluffy half persian kittens to good homes only. 7 weeks old. very cute. call anytime - 0431847757..
Beautiful natured kittens available this week. Breeder registered with QFA and also a veterinarian. Registered with QFA and all kittens come with papers , vaccinated , desexed , microchipped , wormed. Raised in house with small children. Very loving natures. Photos available on request. 6 kittens available. Russian blue x female cat. 18 months old. Has had litter of kittens, unsterilized, good breeder excellent mum. Worm and flea treated. Microchipped. Free to good home only..
FREE TO GOOD HOME *^*^*^ I have 5 adorable kittens ready for their new homes, all very individual from fluffy to short hair to Tortisshell, black&white and ginger. please call 0431882126 anytime to come and have a look..
Half persian kittens $50.00 each. 5 Gorgeous fluffy half persian kittens to go to cat loving families. Wormed and weened.Absolutly adorable. Due to go around 18th April, may view now. Must go to loving homes. Phone any day or time. 0431847757..
PEFET HOMES FOR KERRING PAROT, I WAN DOS WHO ARE KERRING SO THAT DAY CAN TAKE A VERY GOOD FOR THIS MY PEFRCT PAROT SO AM WIATING FOR MORE CONTACT. they need good home and care so please do contact for more information. i have 3 lovely Siberian kittens still available contact (mustafarann@yahoo.com) for more detail on the kitten. Persian Kittens kittens. I have a lovely litter of black and silver spotted, lilac and silver spotted kittens. They will be fully vaccinated, wormed, front lined and insured. They will also be litter trained with a four generation pedigree certificate and Gccf reg. These kittens are absolutely beautiful and have great characters. Cats for sale, kittens for sale Australia ads Australia, Cats for sale, kittens for sale classifieds Australia, Cats for sale, kittens for sale free ads Australia, ads for sale Australia, ads to buy Australia, FREEADSAustralia Page number 3-1. Find here ads for sale, to buy and rent in Australia. Goods for sale in Australia, vehicles for sale in Australia, Australia real estate for sale, Australia property for sale, property for rent in Australia, business ads in Australia, Australia business classifieds, services in Australia, Australia services ads, jobs in Australia, pets for sale in Australia, Australia dating, Australia cars for sale.